Gordon Mortensen is one of the best known reduction woodcut print artists working in the United States . He is also one of the few working artists who still uses the reduction process for printmaking. Mortensen works from watercolor studies to help him understand the color dynamics required of the wood cut. 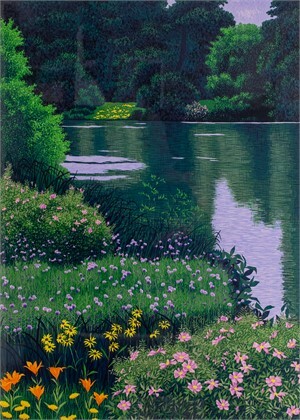 He uses up to 64 colors and takes as long as three months to create the woodblock image. You may notice that the final outcome has a painterly feel. And yet, it is unmistakably a woodcut print. The clues are in the rich layered colors and wood grain textures. His early images represent the upper Midwest landscapes and areas around where he lived in North Dakota. 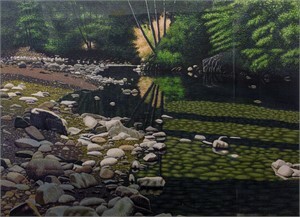 His color preferences in these early works are earthy and muted as compared to the brighter colors he favors to represent his current home in California. First, only one woodblock is used and the whole image is drawn onto it India ink.. Before the first color is printed, any areas that are to remain unprinted (white or the color of the paper) are cut away from the surface of the block. Continuing on, any colors to remain white are the first to be carved out of the surface. Next, the first color is apply to the block and printed on all sheets. Then, any area that is to remain the previous color is carved away and the next color is applied. The same then goes for each subsequent color. In the end, there is very little left of the original block of wood as it has been cut away. About: Gordon Mortensen is one of the best known reduction woodcut print artists working in the United States . 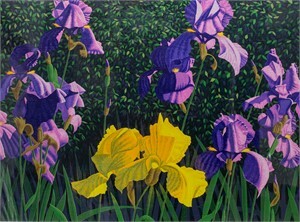 He is also one of the few working artists who still uses the reduction process for printmaking. Mortensen works from watercolor studies to help him understand the color dynamics required of the wood cut. 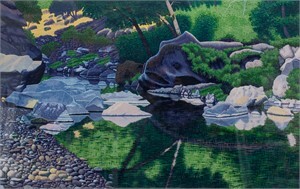 He uses up to 64 colors and takes as long as three months to create the woodblock image. You may notice that the final outcome has a painterly feel. And yet, it is unmistakably a woodcut print. The clues are in the rich layered colors and wood grain textures. 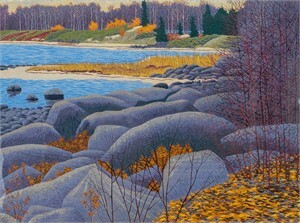 His early images represent the upper Midwest landscapes and areas around where he lived in North Dakota. 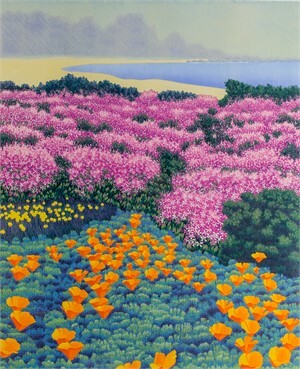 His color preferences in these early works are earthy and muted as compared to the brighter colors he favors to represent his current home in California. Process: First, only one woodblock is used and the whole image is drawn onto it India ink.. Before the first color is printed, any areas that are to remain unprinted (white or the color of the paper) are cut away from the surface of the block. Continuing on, any colors to remain white are the first to be carved out of the surface. Next, the first color is apply to the block and printed on all sheets. Then, any area that is to remain the previous color is carved away and the next color is applied. The same then goes for each subsequent color. In the end, there is very little left of the original block of wood as it has been cut away.